Sega Sammy Holdings announced today its financial results for the first quarter of fiscal year 2017, ended on June 30th, 2016. All income numbers are in the black, with a substantial increase year on year. 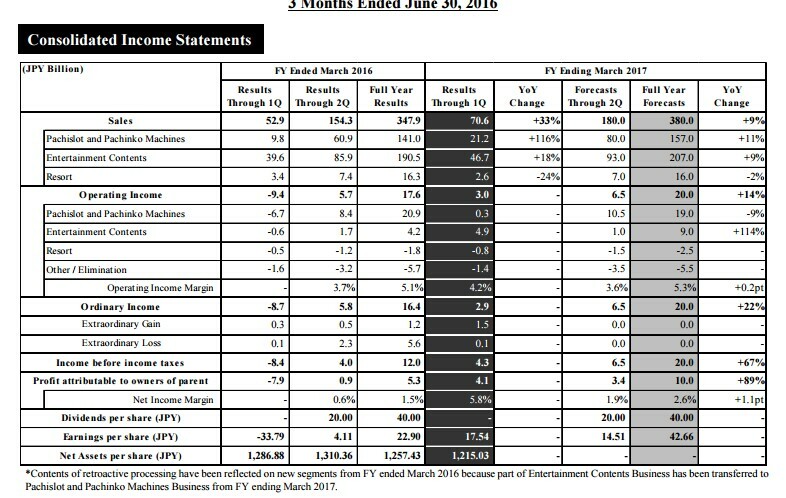 We also get a detailed overview of the company’s performance in the quarter (data related to gaming is bolded). With regard to the pachislot and pachinko industry, in the pachislot machine market, pachinko parlor operators have adopted a cautious approach to replacement of machines to those compliant with the change in the application of the model test procedure by the Security Communications Association, which conducts model tests for pachislot and pachinko machines. On the other hand, titles receiving high appraisal are arising mainly in some series with successful track records. Meanwhile, pachinko machine market remains uncertain, in line with the application of the voluntary agreement on measures to prevent players from becoming too immersed in playing, which were decided by Nikkoso, an association of pachinko machine manufacturers. Under these circumstances, sales of titles in the first quarter of the fiscal year ending March 31, 2017 decreased due to voluntary restraint in replacement demand for new machines in line with Japan hosting the 42nd Annual G7 Summit Meeting in Ise-Shima (G7 Ise-Shima Summit), and replacement demand for new pachinko and pachislot machines temporarily remained at low levels. In order to revitalize the market going ahead, it is essential to develop and supply machines that are compliant with various voluntary regulations and capable of appealing to a wide range of players. Regarding the environment of the Entertainment Contents Business, a slowdown in the spread of smartphones in Japan and the predominance of top titles are accelerating in the market for digital games for smart devices. Therefore, provision of higher-quality content is expected, resulting in a trend of longer development lead times and higher operating costs. Meanwhile, in overseas business, future growth is expected mainly in Asia. 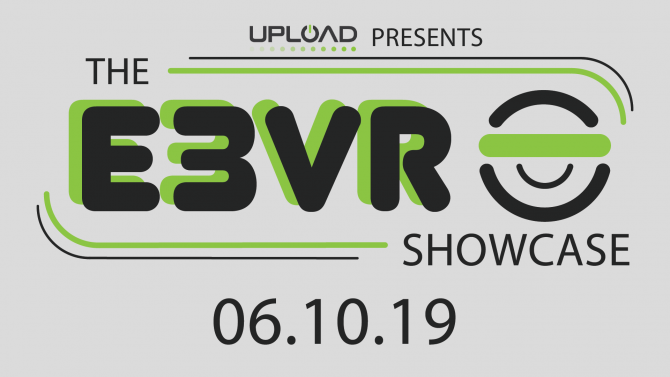 With regard to the packaged game software market, expectations are rising for future expansion of the market due to the penetration of next generation hardware of home video game console. In Europe, the U.S., and Asia, large markets have been developed for PC games. As for the market for amusement centers and amusement machines, signs of improvement in facilities utilization and expansion of the player base are showing mainly in new video game titles. In the resort industry, thanks to a continuous increase in the number of foreign visitors to Japan, an upward trend in the hotel occupancy rate is still evident and revenues of amusement parks and theme parks continue to exceed the previous year’s level. With a view to establishing Japan as a popular tourist destination, a bill concerning the promotion of the establishment of specified integrated resort areas (Integrated Resort Promotion Bill) has been submitted to the Diet. In this business environment, net sales for the first quarter of the fiscal year ending March 31, 2017 amounted to ¥70,634 million, an increase of 33.4% for the same period in the previous fiscal year. The Group posted an operating income of ¥3,055 million (operating loss of ¥9,455 million for the same period in the previous fiscal year), ordinary income of ¥2,985 million (ordinary loss of ¥8,706 million for the same period in the previous fiscal year) and profit attributable to owners of parent of ¥4,111 million (loss attributable to owners of parent of ¥7,930 million for the same period in the previous fiscal year). With regard to the Entertainment Contents Business, “PHANTASY STAR ONLINE 2” distribution on PlayStation®4 has started in the field of digital game software, and the number of simultaneous access reached the largest ever 130,000, breaking the record. It celebrated the fourth anniversary from its release on July 4, 2016, and it continues to maintain its popularity. With regard to titles for smart devices, we launched a new title, “Liberasion of azure”, and sales remained robust for major titles mainly including “CHAIN CHRONICLE – Kizuna no Shintairiku”, for which we hosted various events, “Puyopuyo!! Quest”, for which we hosted third anniversary events, and “Hortensia SAGA”, for which we ran first anniversary campaigns. In the packaged game software field, sales amounted to 2,410 thousand copies, which was higher than the level for the same period in the previous fiscal year, as sales were strong for the titles for overseas market, such as “Total War: WARHAMMER”, the latest title of “Total War” series, which is highly popular mainly in Europe and has sold more than 20 million copies in 16 years. n the animated film and toy field, the highest-ever box-office revenue for the series were recorded for the theater film “Detective Conan The Darkest Nightmare”, continued from the previous film. In addition, the Group implemented the sale of toy products of regular and major products and services particularly the “Anpanman” series. As a result, net sales in this segment were ¥46,700 million (an increase of 17.9% for the same period in the previous fiscal year) and operating income was ¥4,941 million (operating loss of ¥699 million for the same period in the previous fiscal year). 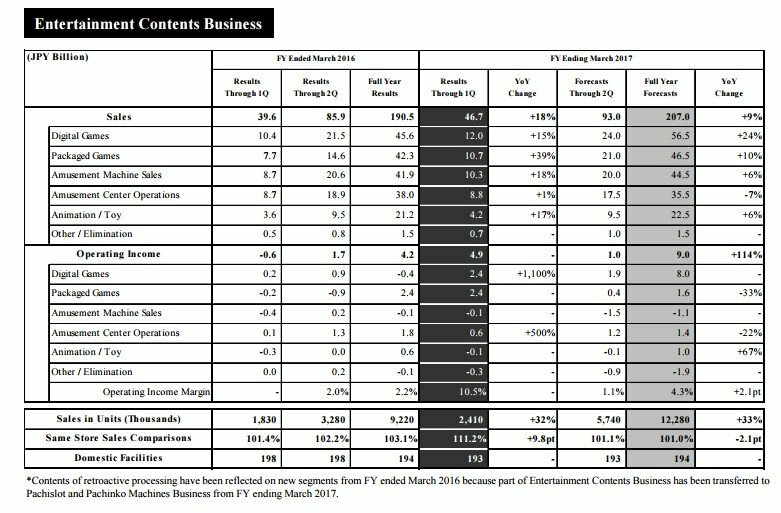 We also get the outlook for the full fiscal year, including a detailed overview of the prediction for the entertainment content business. In the field of digital game software, the Group updated “PHANTASY STAR ONLINE 2” in line with its fourth anniversary events. For the smart device titles, the Group will host third anniversary events for “CHAIN CHRONICLE – Kizuna no Shintairiku” and add new stories. 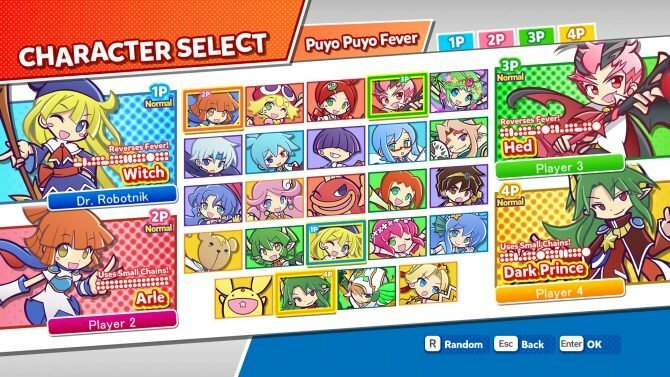 Further, the Group plans to carry out major updates of the existing major titles and host various events, including carrying out major updates and hosting various events for “Puyopuyo!! Quest” and the collaboration between “Hortensia SAGA” and “Fate/stay night[Unlimited Blade Works]”. 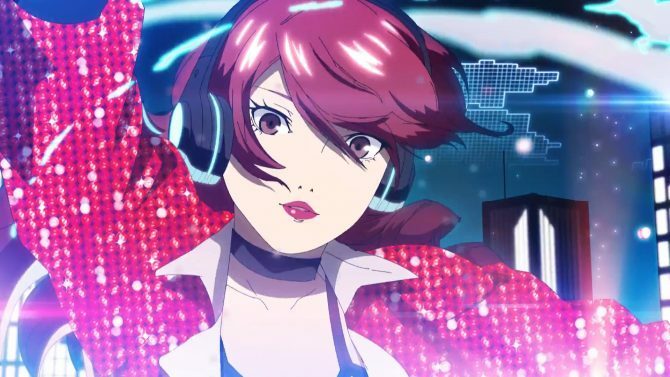 In the packaged game software field, the Group plans to launch titles focusing on mainstay IP titles such as “Persona5”. In the amusement machines and amusement center operations field, the Group will strive to continuously improve profitability through continued contribution to income by revenue share titles such as “KanColle Arcade” and launching of new titles. In the animation film and toy fields, the Group expects to record income from distributing a theater film “Detective Conan The Darkest Nightmare”, and for toys, plans to market products focusing on the major product “Disney Character Magical Pod” and others. Below you can find additional data including game unit shipments broken down by region, with the overseas market dominating the packaged games market for the first quarter of the current fiscal year, due to the successful launch of Total War: Warhammer. 2.3 million units have been shipped outside of Japan between April 1st, 2016 and June 30th. That said, the full year forecast also sees a large spike of sales in Japan, most probably due to expectations for strong Japanese titles like Persona 5, Yakuza 6, and Valkyria: Azure Revolution, that are all scheduled to launch before March 31st, 2016. Sega expects to ship 2.28 million game units in Japan, and ten million units overseas. Both figures are significantly higher than those related to the past year.